These cracker snacks have all the flavour of nachos in a bite-size format! 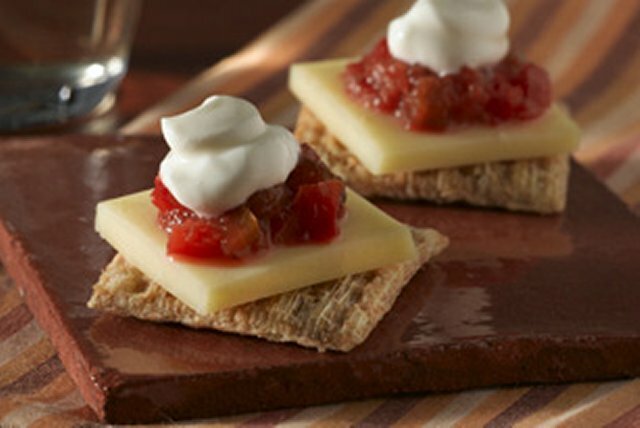 TRISCUIT Crackers are topped with cheddar cheese, sour cream and salsa for a simple snack or party-perfect appetizers. Pairs well with a glass of Pinot Noir. Prepare as directed, using Triscuit Cracked Pepper & Olive Oil Crackers. Since these tasty appetizers are made with better-for-you ingredients, they can fit into a healthful eating plan.